In a press release issued early this morning, Research In Motion confirmed what most folks out there already understood. When it comes to security on handheld devices Research In Motion, BlackBerry devices and now, their latest BlackBerry 6 OS rank as high as you can get when it comes to security. BlackBerry 6 is now FIPS 140-2 certified. In layman terms, it's ok to load BlackBerry 6 onto President Obamas BlackBerry Bold 9700 as it's been tested and approved to be secure. Although, by the time carriers approve it he may no longer be President. "This FIPS certification will help extend the reach of BlackBerry 6 to users in a wide range of government agencies and other security-conscious organizations in the U.S.," said Scott Totzke, Vice President, BlackBerry Security Group at Research In Motion. "BlackBerry 6 offers an exceptional mobile experience for BlackBerry smartphone users on the most secure wireless platform in the industry." Maybe now that it's been FIPS certified we'll see it roll out officially to more carriers and devices? Full press release is available after the break if you want to dig into the finer details. WATERLOO, ONTARIO--(Marketwire - Dec. 1, 2010) - Research In Motion (RIM) (NASDAQ:RIMM)(TSX:RIM) announced today that BlackBerry(R) 6, a powerful new operating system for BlackBerry(R) smartphones, is now FIPS 140-2 certified. 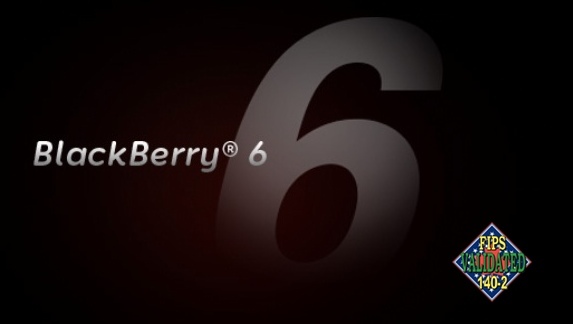 This FIPS (Federal Information Processing Standard) certification provides confidence to a variety of security-conscious organizations, including U.S. government agencies, companies in regulated industries and other organizations dealing with sensitive information, that data stored on smartphones running BlackBerry 6 can be properly secured and encrypted. BlackBerry 6, which debuted on the BlackBerry(R) Torch(TM) smartphone earlier this year, retains the trusted features of the BlackBerry brand while delivering a rich experience that's powerful and easy to use. It has a redesigned interface, includes expanded messaging capabilities, enhanced multimedia support and a new and rich WebKit-based browser that delivers fast Internet browsing. In addition to the BlackBerry Torch, BlackBerry 6 ships on the new BlackBerry(R) Bold(TM) 9780 and BlackBerry(R) Style(TM) smartphones. BlackBerry 6 can also run on the BlackBerry(R) Bold(TM) 9650, BlackBerry(R) Bold(TM) 9700, BlackBerry(R) Curve(TM) 3G and BlackBerry(R) Pearl(TM) 3G smartphones (subject to carrier certifications). FIPS is a U.S. government computer security standard for certifying cryptographic modules. The standard was developed through the Cryptographic Module Validation Program (CMVP), which certifies products for use by U.S. government agencies and regulated industries that collect, store, transfer, share and disseminate sensitive information. Product certifications under the CMVP are performed in accordance with the requirements of FIPS 140-2. In addition to various FIPS certifications, BlackBerry(R) products have passed rigorous security assessments from a variety of other independent organizations around the world. For example, the BlackBerry(R) Enterprise Solution has been approved through the CESG Assisted Product Scheme (CAPS) in the United Kingdom and by the Defence Signals Directorate in Australia, and has also received Common Criteria EAL 4+ certification." As a result, the BlackBerry Enterprise Solution has been approved for storing and transmitting sensitive data by the North Atlantic Treaty Organization (NATO) as well as government organizations in the United States, Canada, the United Kingdom, Austria, Australia and New Zealand. For more information about security and the BlackBerry platform visit www.blackberry.com/security. Research In Motion (RIM), a global leader in wireless innovation, revolutionized the mobile industry with the introduction of the BlackBerry(R) solution in 1999. Today, BlackBerry products and services are used by millions of customers around the world to stay connected to the people and content that matter most throughout their day. Founded in 1984 and based in Waterloo, Ontario, RIM operates offices in North America, Europe, Asia Pacific and Latin America. RIM is listed on the NASDAQ Stock Market (NASDAQ:RIMM) and the Toronto Stock Exchange (TSX:RIM). For more information, visit www.rim.com or www.blackberry.com.